Miranda, Ariel, Umbriel, and Oberon. Since all of Uranus’s moons orbit the planet on their sides and almost exactly in the planet’s equatorial plane, each of Titania’s poles spend 42 years (50% of Uranus’s orbital period around the Sun) in perpetual sunlight, and 42 years in perpetual darkness. Thus, at each solstice, the Sun rises almost exactly at the zenith above each pole. 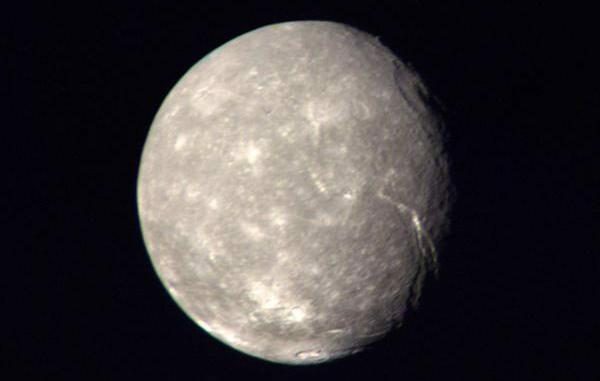 Titania’s high density suggests that it had either formed from a disc of dust and debris that was left over after Uranus had formed, or from the debris of the proposed collision that tilted Uranus onto its side. While the exact nature of the material from which Titania had formed is not known with any degree of certainty, the high density of Titania and other Uranian moons suggest that this material contained comparatively little water, unlike the material from which some of Saturn’s other moons had formed, which is reflected in their high percentage of water ice, and correspondingly lower density. While very little is known about the geological processes that take place on Titania, it is likely that the huge canyons in the moon’s icy crust are the result of the subsurface layers (possibly a frozen subsurface ocean) freezing shortly after the moon’s formation. If these layers did indeed freeze, it would have expanded by about 7%, while the outer layers contracted as it cooled. The opposing forces would have caused the surface to crack, resulting in the fissures that cover most of the observed parts of the moon. Since Uranus and its moons orbit the Sun almost on their sides, the moons receive more solar radiation on their poles than their equators. In practice, this means that carbon dioxide that had collected on the polar regions get warmed by the Sun when a pole faces sunward; thus, when a polar region reaches a temperature of about 85–90K (-1880 C), the carbon dioxide sublimates, and migrates to the equatorial and opposite polar region. This process is reversed when the opposite pole faces the Sun, thereby maintaining a sort of carbon cycle, somewhat similar to the hydrological cycle on Earth. The observed presence of relatively large amounts of carbon dioxide on Titania suggests that the moon may maintain an atmosphere consisting almost entirely of carbon dioxide. During an occultation of the star HIP106829 by Titania in 2008, such an atmosphere was indeed confirmed, but it turned out to be extremely tenuous, and seasonal at that, with a maximum possible surface pressure of only 10–20 nanobars (1-2 millipascal). The paucity of impact craters on Titania is thought to be the result of endogenic processes that have all but obliterated the original surface. However, while much about the moon’s evolution remains unknown, the process of resurfacing was almost certainly tectonic in nature, although much of Titania’s surface appears to be covered by ejecta, which is relatively smooth “blankets” of material that was excavated during major impact events such as the formation crater Gertrude, the largest known crater on the moon, which has a diameter of 326 km (202 miles). Titania orbits Uranus in an almost perfectly circular orbit, at a distance of 436,000 km (271,000 miles), taking 8.7 days to complete an orbit at an average speed of 3.64 km/sec. Titania’s orbit has an eccentricity of only 0.0011, and is inclined relative to Uranus’s equator by only 0.340 degrees. The moon is also tidally locked to Uranus, meaning that its own rotation equals its orbital period. Although Titania is rather dim at an apparent magnitude of +13.9, it is easy to find with a large aperture amateur telescope today. However, for nearly 50 years after its discovery, only its discoverer, William Herschel could see it, for reasons that are not entirely clear. While Herschel was a skilled observer, other equally skilled observers failed to observe Titania. One possible explanation is that Herschel’s instrument was simply outperforming all others in the world at the time, which is entirely plausible, because Herschel was as an accomplished a telescope maker as he was an observer. The largest canyon on Titania, Messina Chasma, stretches across 1,492 km (927 miles) from the moons’ equator nearly to its south pole. Named after Messina, a location in Shakespeare’s play, Much Ado About Nothing, the feature consists of two normal faults that cut across numerous impact craters and other features, which suggests that this structure must have formed comparatively recently in the moon’s history. By way of comparison, the Grand Canyon in the USA is only 446 km (277 miles) long.